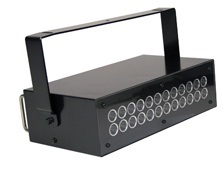 The NEW SHIMPO DT-329 Linear Stroboscope employs High Brightness LED Technology. No other strobe on the market delivers a crisper, clearer image while operating at all flash rates with High Brightness. Even at ultra high repeats up to 120,000 (FPM), the service life of the DT-329 is 5x’s greater than many traditional stroboscopes which incorporate xenon flash tubes. Due to LED engineering, which eliminates the need for xenon flash tubes, no sound is produced when in use; an added benefit and a great asset for audio and speaker research. The DT-329 is ideal for wide and narrow web printing, motion and machine vibration analysis, audio (speaker) research, pulp and paper manufacturing and a wide range of rolling mill applications. Easy to mount and set up, the DT-329 ’s design provides for daisy chain and external triggering methods. Phase shifting (flash advance/delay in degrees and mSec), external and internal flash control, and a back-lit LCD display provides the operator an easy to use visual inspection tool to monitor production quality under all line speeds.